"Sooner or later, all the peoples of the world will have to discover a way to live together in peace, and thereby transform this pending cosmic elegy into a creative psalm of brotherhood. If this is to be achieved, man must evolve for all human conflict a method which rejects revenge, aggression, and retaliation. Follow the links at the bottom right of each page to view the entire memorial. 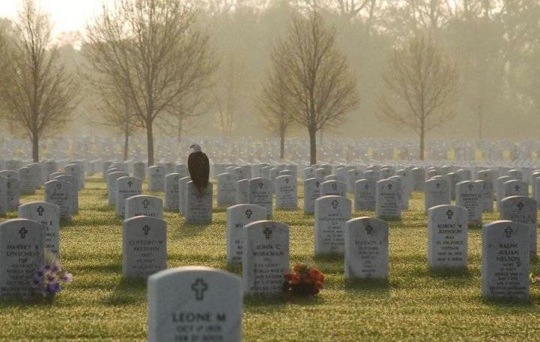 America's golden eagle standing guard over our hero's graves. A photo from the Minneapolis Star/Tribune taken on a June morning at the Minneapolis National Cemetery. Click here for song lyrics to "I Can't Cry Hard Enough"